I want everyone to understand that I know I'm a lucky woman. Spouse would do almost anything for me. He stands up for me, cheers me on, takes care of me if I'm sick (I get temporary control of the remote and the sofa), and he recognizes that anything he says or does could become fodder for my weekly column. Notice I said “almost”. There is one area I cannot get him to take seriously and there are days when I doubt that whole "I'd take a bullet for you" thing because of this important subject. Spouse will not kill a spider for me. I hate spiders. I know humans are much bigger than most spiders and there is seldom a good reason to be afraid of them. You can point out that they are almost always harmless, but after two recent spider encounters I did some research. I was carrying laundry to the washing machine in our basement when from the steps I spotted a huge spider - I mean seriously huge - inside an empty laundry basket six feet away. I bellowed for Spouse to hurry downstairs with an empty jar of some kind so he could catch and release it. I would have preferred to squish it with a five-pound weight (if I wasn't too scared to get that close) but that’s not his style. He took the laundry basket, spider and all, and walked up the steps and outside where he deposited the fang-toothed beast somewhere far away from the house, I hope. After peering around every corner as I started the laundry, I went on an Internet search and found at least three varieties of spider that our visitor could have been. I was convinced it was a brown recluse and immediately started debating about how important it really was to do laundry or use the extra freezer or clean the cat boxes - anything that entails going into the basement. But it also could have been a nursery web spider or a grass spider or even a dark fishing spider. I’m trying to be positive. I’m positive I hate spiders. These are the times when I wish Spouse would take a swing at things that freak me out like spiders, but he is an animal lover to the extreme. 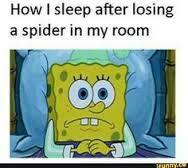 Besides, he thinks I’m a wimp who makes too big of a deal out of my arachnophobia. It isn’t just big scary looking spiders that bug me. Even the small ones remind me of scorpions or tarantulas. The other morning I was cooking breakfast and one of those fast moving little spiders appeared out of nowhere, defying death by sidling along the edge of the stove. I know he was snickering at me when I cowered and yelped for the one person I should be able to count on to help. Half crumpled paper towel in hand, I was ready to squash the little sucker and toss his eight-legged tiny carcass into the trash, but "Someone" had to come along and catch him, except he didn't catch him (or her - whatever it was, it didn't belong on my stove). He picked the spider up and let it crawl on his hand... until it jumped off and disappeared into the silverware drawer. There I was standing at the stove trying not to burn my eggs while keeping a distance from the drawer, and Spider Hero was digging through the forks, knives and measuring spoons trying to spot my mini adversary. I was way past not happy at this point. In an attempt to not apologize, Spouse said, "I wanted to take him out." "So did I," I growled. He never found the spider. Now every time I open the top drawer I stand back just in case. That thing may be little but it had some serious spring. I was just reading last week that spiders appear most often in early September, so I guess I can’t do much about avoiding them. I did, however, put Spouse in charge of supper that night, just in case his beady-eyed buddy decided to make an appearance. I guess I shouldn’t complain. I do still believe Spouse would take a bullet for me – as long as no spiders were harmed in the process. P.S. By the time I got around to posting this, October rolled around. I just hope the spiders have calendars.